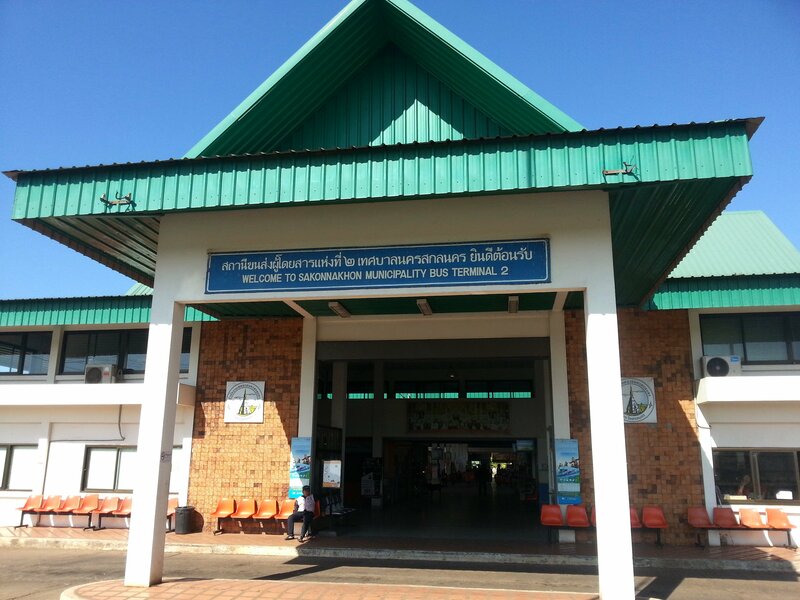 Sakon Nakhon Bus Terminal 2 is the main long distance bus station in Sakon Nakhon, and it is located some distance outside of the town centre near to Sakon Nakhon Airport on the main highway to Udon Thani, which is the nearest connection point to the Thai railway network. Sakon Nakhon Bus Terminal 1 is a city centre bus station with local bus services and shared taxi services to towns and villages within Sakon Nakhon province. 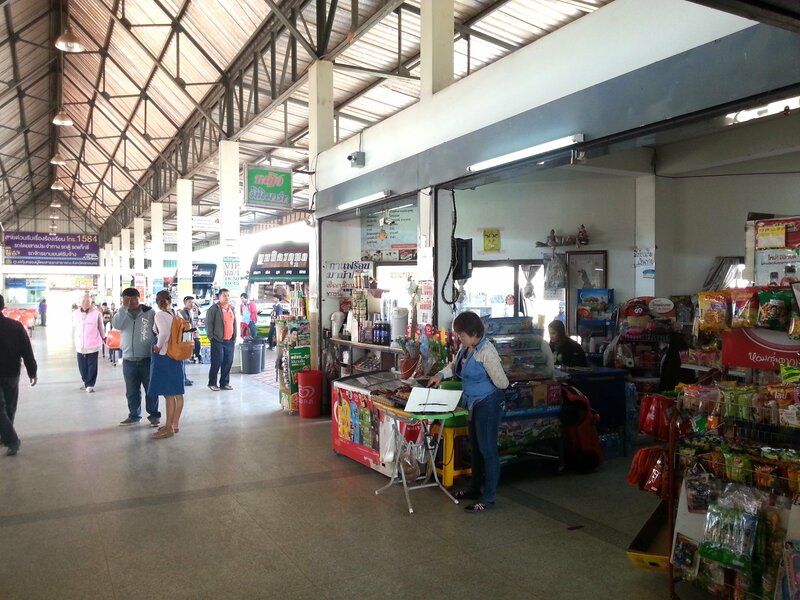 Sakon Nakhon Bus Terminal 2 is a busy station as it the main transport hub for the town. There is no railway station in Sakon Nakhon and flights from Sakon Nakhon Airport only go to and from one place: Don Mueang Airport in Bangkok. There are three basic categories of transport departing from this station: minivans to smaller destinations; ordinary bus services plying the major routes to towns such as Udon Thani and stopping frequently on route to let me off the bus on the highway or at small provincial towns,;and better quality bus services which travel direct to other large towns with relatively few stops on route. Minivans and ordinary bus services can be booked locally and they are very cheap, but often very slow because they stop a lot and often take very indirect routes to drop passengers off at smaller towns and larger villages. The bus services listed below are the better quality and quicker intercity buses which you can, and should, book in advance. There are two ways to get between Sakon Nakhon town and Sakon Nakhon Bus Terminal 2 other than walking, which we don’t advise that you attempt as its over 5 km and the most direct route is down a major highway with no footpath. The quickest option is to take a motorbike taxi. Normal taxis do operate in Sakon Nakhon but they are a rare sight and generally need to be booked in advance. The standard fee for a motorbike taxi either way between the intercity bus terminal and the town was 80 THB when we checked in January 2019. 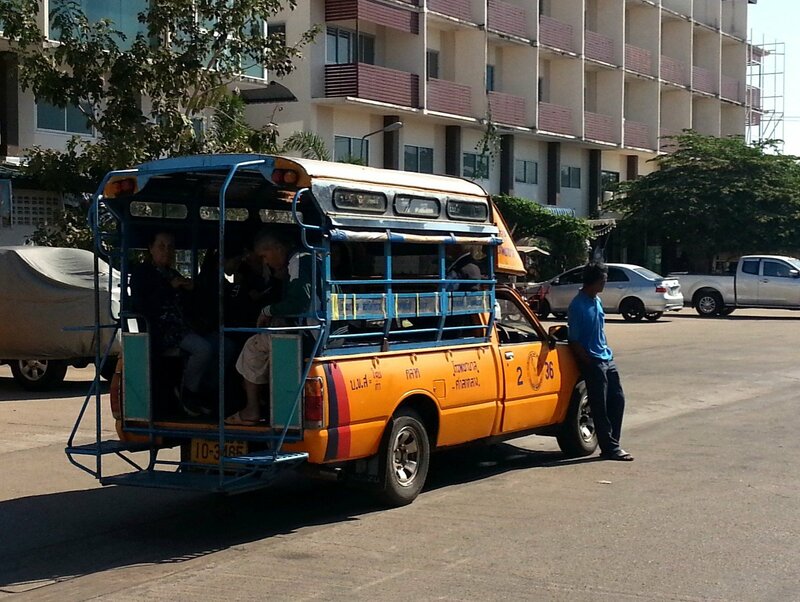 The other form of local transport between Sakon Nakhon town and Sakon Nakhon Bus Terminal 2 is by shared taxi. The fee, payable directly to the driver, is 20 THB. Shared taxis run a variety of routes so you need to ask the driver whether they are going to your destination. Most of the shared taxis appear to travel in loop between the town and Bus Terminal 2 via major points of interest in Sakon Nakhon such as Wat Phra That Choeng Chum and Wat Pha Suttawas. 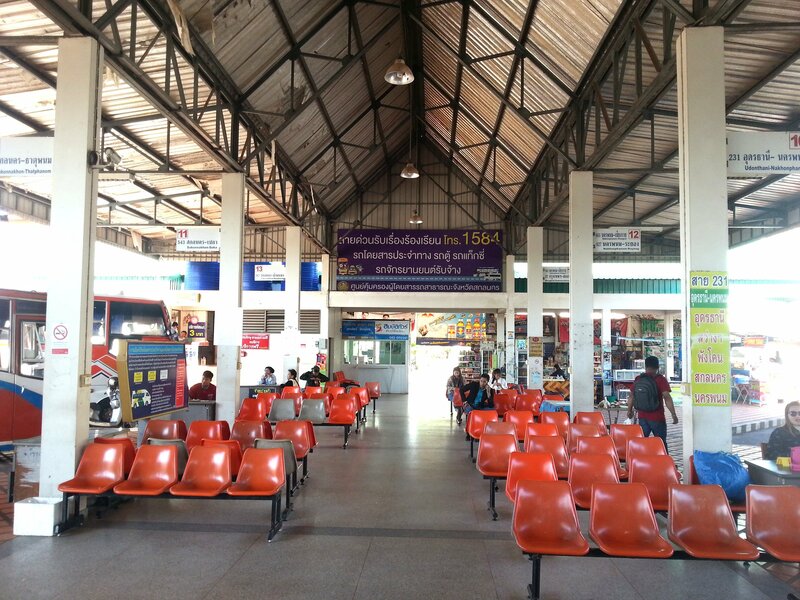 Sakon Nakhon Bus Terminal 2 is located 5.7 km from Wat Phra That Choeng Chum. Sakon Nakhon Bus Terminal 2 is a medium sized bus station (by Thailand standards) with fairly modern facilities, although the waiting area by the bus platforms is open air. Toilets at the opposite end of the station to the ticket hall which cost 3 THB to use. Shops selling drinks and snacks at either end of the main outdoor waiting area. Seating inside an air-conditioned room by the ticket hall and outside by the the bus platforms. Food stalls around the edge of the station in the bus parking lot. Tickets for long distance bus services need to be purchased at the ticket counters in the ticket hall by the main entrance to Sakon Nakhon Bus Terminal 2. Each bus company has its own ticket counter. 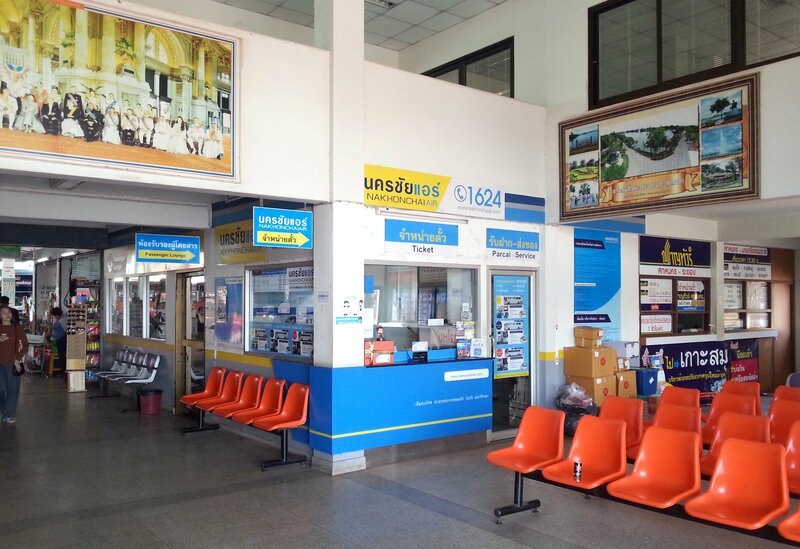 For ordinary bus services and minivan services you need to buy your ticket from the desk near the relevant bus platform at Sakon Nakhon Bus Terminal 2. Bus and minivan services to a particular destination all depart from the same platform. The way to find the right bus platform, and therefore the correct ticket desk, is to look at the destination signs above each bus platform. For example, bus services to Rayong and Chiang Rai depart from Platform 12. For other destinations than Bangkok enter the name of destination into the Search Box by typing the first three letters of the place name and then using the drop down list. There are three daily bus services from Sakon Nakhon to Udon Thani which you can book online. Journey Time: The journey takes between 2 hours 15 minutes. Tickets: Check for ticket availability for bus services from Sakon Nakhon to Bangkok. There are three daily bus services from Sakon Nakhon to Chiang Mai which you can book online. Journey Time: The journey by bus takes 14 hours 25 minutes. Tickets: Check for ticket availability for bus services from Sakon Nakhon to Chiang Mai. There are three daily bus services from Sakon Nakhon to Loei which you can book online. Journey Time: The journey by bus takes 5 hours 00 minutes. Tickets: Check for ticket availability for bus services from Sakon Nakhon to Loei. There are two daily bus services from Sakon Nakhon to Uttaradit which you can book online. Journey Time: The journey by bus takes 11 hours 00 minutes. Tickets: Check for ticket availability for bus services from Sakon Nakhon to Uttaradit.